Healthy foods with very good taste for an amazing culinary experience are perfect to share with friends or couples in authentic atmosphere. Our teams invite you in your hotel 4 star to savor gourmet dishes with local products, for a journey with many authentic and creative flavors. A restaurant and its charming terrace with view on the River Adour, offers innovative cooking with typical South-West cuisine. A warm atmosphere in a refined setting of Art Deco influence is perfect to spend an exquisite moment with two or in group. A smokehouse transformed into a second intimate restaurant with a cozy and distinguished decoration, is a real delight for the taste buds. 3 bars, 3 different atmospheres that is evolving according to the seasons, offer a quality menu and adapted to the wishes of all our customers: high-end spirits, festive cocktails or Detox cocktails, ideal to prolong your experience of softness in the spa. 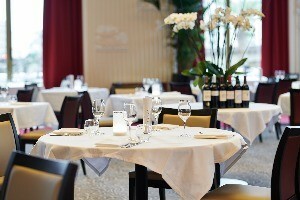 For aperitif and end of evening in all festivities, a terrace bar with view on its landscaped garden. An Art Deco bar inspired by a spirit of yesteryear for a cozy atmosphere. A bar in the majestic entrance of the hotel sublimated by its golden silhouettes and stylized glasses.